Panasonic offers a range of advanced laboratory instruments with the optimum quality and durability for the pharmaceutical industry, thanks to its application specific designs and purpose-built technology. Pharmaceutical companies can obtain several benefits in partnership with Panasonic, including unprecedented sample protection and support to the state-of-the art studies in the biotechnology, pharmaceuticals, and medical fields. This article discusses the various pharmaceutical solutions offered by Panasonic. Panasonic follows installation and operational protocol (IOQ) to provide onsite validation for its equipment. Installation qualification (IQ) involves verifying and documenting the instrument installation in conformance with the specifications and requirements of the manufacturer. Operational qualification involves verifying and documenting the complete operational status of installed instrument in accordance with specifications of Panasonic or other OEM supplied equipment. The protocol also involves mapping temperature performance continuously over a period of 24 hours and comparing the resulting data with the published equipment specification of the manufacturer. The IOQ protocol for a specific instrument can also include product specific parameters like the %RH, CO2/O2, and so on. End-users generally perform process qualification (PQ) of the installed equipment. The specific standard operation procedure documents (SOPs) of customers will be taken as reference to perform the PQ. Comprehensive factory acceptance testing includes temperature recovery, carbon dioxide and temperature stability, and alarms. Customization of this service with respect to SOPs is possible. Panasonic offers reliable and high-performance freezers, which show 40% more efficiency than similar products in the market owing to their innovative heat exchanger technology. The vacuum insulation panel (VIP) technology used by the Panasonic VIP ECO Series increases storage capacity by 30% by lowering wall thickness by roughly 50%. Consequently, there is roughly 40% reduction in the average cost per box. Moreover, smaller compressors are employed by the VIP ECO freezers owing to the greater efficiency of natural hydrocarbon refrigerants. These freezers have 40% lower emissions, thanks to the unique combination of the VIP insulation technology and natural hydrocarbon refrigerants. 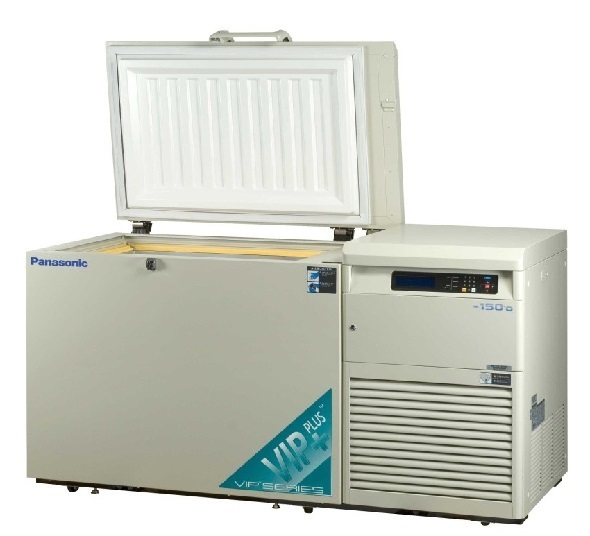 The Panasonic VIP Dual Cool Series of ultra-low freezers (Figure 1) stores high-valued materials for long term with unprecedented sample integrity, energy efficiency and temperature uniformity. The presence of two independent refrigeration systems provides continuous sample protection even during the failure of one compressor. These freezers maintain superior temperature uniformity at all points while providing rapid temperature recovery, thus ensuring reliable sample security through prevention of sample degradation and assurance of sample stability at each inventory location. 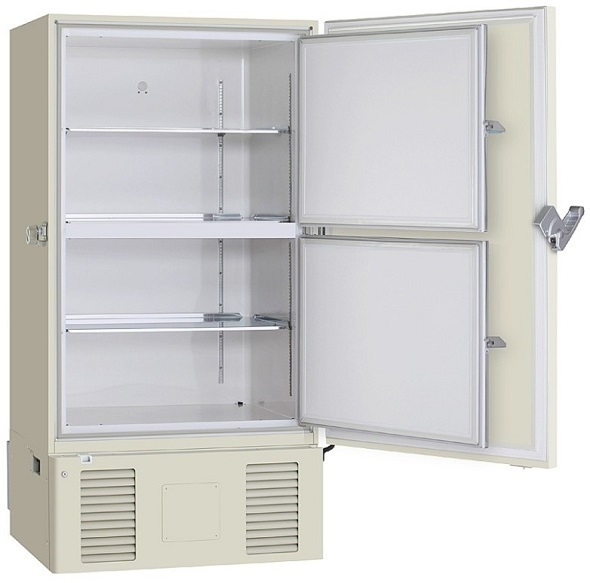 These freezers are suitable for storage of samples that are vulnerable to non-uniform temperature distribution or temperature fluctuations, irreplaceable samples, high-valued samples. Using Panasonic biomedical freezers (Figure 2), samples can be stored at temperatures down to -40ºC for intermediate or long term. 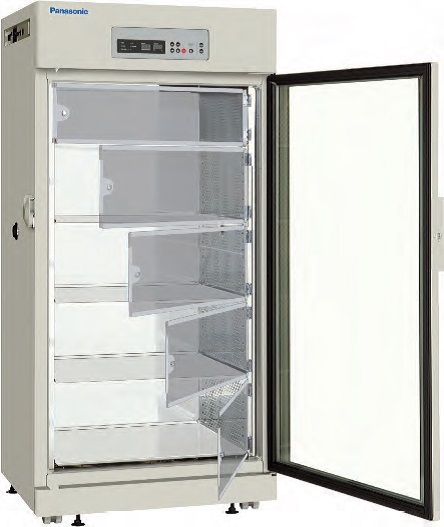 Samples such as medicines, biologics, and enzymes can be effectively stored in these freezers as they are equipped with time-tested laboratory and clinical-grade refrigeration systems. These freezers feature a microprocessor-controlled digital display to configure alarms, temperature set-points, diagnostic and monitoring functions. 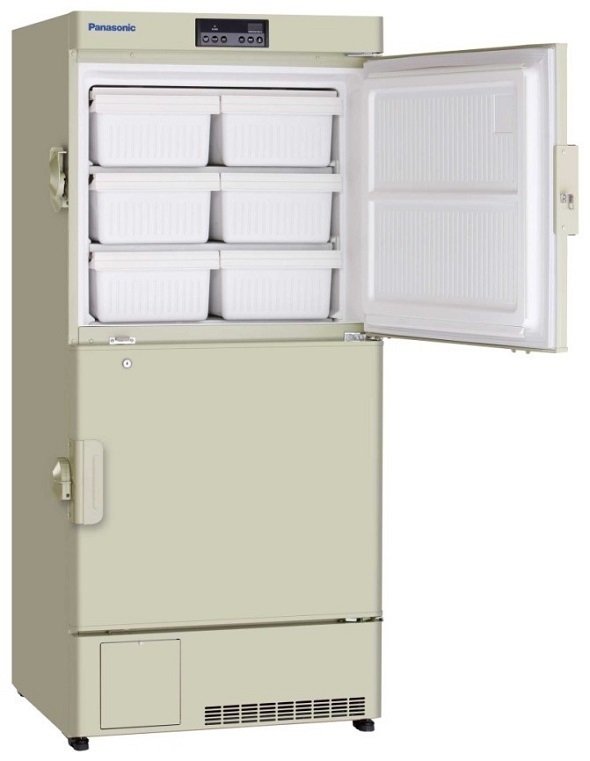 All Panasonic -30ºC and -40ºC biomedical freezers come with a wide selection of storage options. The effects of door openings are minimal in the Panasonic biomedical freezers as they have rapid pull-down speeds. Temperature uniformity is maintained across the chamber through direct cooling using a full cold wall design. Temperature uniformity and stability inside the chamber is outstanding with no temperature spikes, making the Panasonic biomedical freezers an ideal storage solution for biologics and enzymes. 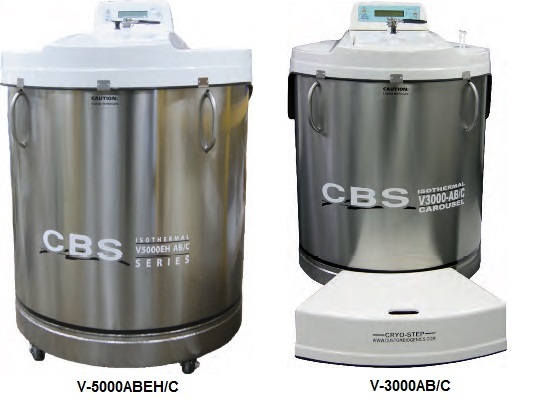 Tissues and cells can be reliably preserved for the long-term using the Panasonic cryogenic freezers (Figure 3) due to their ability to maintain unvarying temperature at -150ºC. The thin VIP walls not only provide more storage capacity, but also maintain better temperature uniformity within the cryogenic freezers when compared to conventionally insulated freezers. Panasonic mechanically refrigerated cryogenic freezers not only provide a better top-to-bottom temperature uniformity (±5ºC) but also eliminate the risk of cross-contamination when compared to liquid nitrogen vapor phase storage. 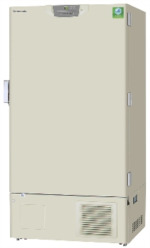 Panasonic’s Isothermal Carousel liquid nitrogen vapor storage system (Figure 4) features an advanced -190ºC isothermal design, an interior rotating carousel, and a small opening, which maintains the freezer temperature continuously low, ensures lightweight and user-friendly lid, and lowers liquid nitrogen consumption. 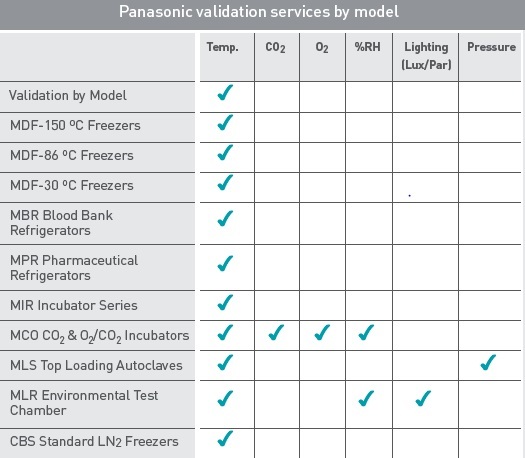 Panasonic specially designs its refrigerators (Figure 5) in conformance with pharmaceutical regulations, satisfying important validated storage regulations through the unique combination of easy calibration access and outstanding temperature uniformity. The chamber temperature is monitored by a thermistor sensor, whereas microprocessor controls help maintain the set temperature accurately. Temperature recovery is rapid even during frequent door openings, thanks to the circulation fan. As a result, a stable preservation environment immune to ambient temperature can be achieved. During compressor “off” cycles, ice buildup is sensed and defrosting is carried out automatically whenever needed, thus providing further sample protection against unwanted temperature fluctuations. Panasonic’s state-of-the-art technology allows pharmaceutical companies to achieve faster turnaround and market-reach time of their drugs. A copper-enriched stainless steel interior (inCu-saFe®) in conjunction with an ultraviolet light provides proactive contamination control. The surface of the inCu-saFe® has stainless steel’s anti-corrosive nature and copper’s germicidal properties. The chamber temperature is exceptionally uniform owing to a patented direct heat and air jacket heating system with natural convection airflow surrounding the inner walls. 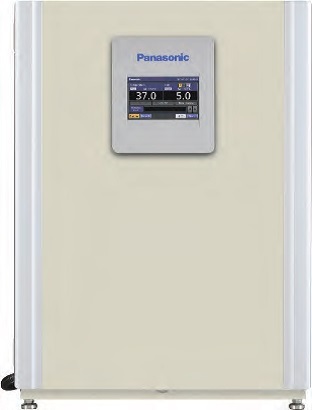 The Panasonic incubator (Figure 6) controls carbon dioxide levels exceptionally using a dual infrared sensor, offering a steady environment for the growth of cells even with frequent door openings. The novel SafeCell® UV system further avoids contamination within the incubator using a programmable ultraviolet lamp, which performs sterilization of air and the humidity water pan with no impact on cell cultures. It suppresses the growth of impurities like mycoplasma without the need for expensive HEPA filter air scrubbers, which are not effective on below 0.3µm particles. Decontamination is completely achieved using Panasonic’s hydrogen peroxide technology at a rate 8X faster than traditional high heat techniques. The cycle takes only 3 hours, which includes the post UV transformation of H2O2 into oxygen and water for easy cleaning. As a result, scientists can resume their cell culture work on the same day and companies can perform drug discoveries rapidly. The high-efficiency and user-friendly cell culture incubator featuring robust systems and processes facilitates users to perform their work conveniently. The Panasonic MCO-170AIC CO2 incubators (Figure 7) save lab space with their new integrated shelf, with space to handle up to 25% more culture vessels. The data can be easily stored in a USB memory stick to be transferred onto a PC for optimized cell culture protocols in compliance with SOPs. 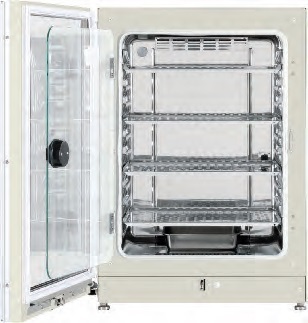 Cleaning the MCO-170AIC CO2 incubator is highly convenient, the small number of removable parts compared to conventional incubators, new interior design and integrated shelf, lowers the concern of contamination and saves valuable time. The Panasonic MCO-80IC large-scale reach-in incubator (Figure 8) allows for the growth of a larger number of cell lines simultaneously, enabling users to perform cell culture on a large scale. Faster turnaround and better cell yield can be achieved, thanks to the temperature and carbon dioxide sensors, and optimized decontamination technologies such as around-the-clock active background contamination control with UV light option. 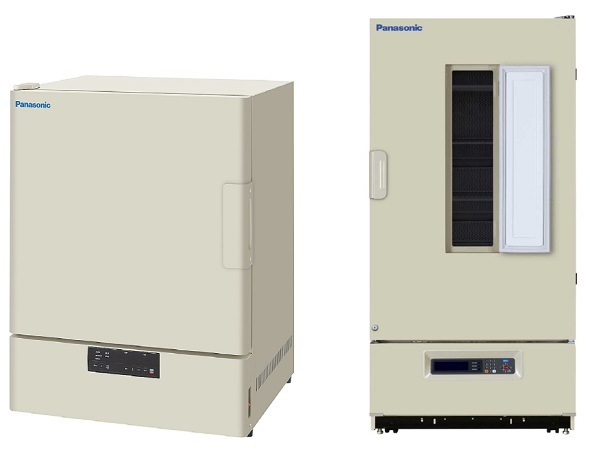 In addition, optimal temperature configuration can be achieved for various protocols, including chemical, industrial, QA and QC testing, using the Panasonic heated and cooled incubators (Figure 9). Panasonic offers a range of solutions for the optimization of pharmaceutical laboratories through reliable validation, enhanced efficiency, and significant cost reduction. The combination of the Panasonic incubators, pharmaceutical refrigerators, and ultra-low freezers provides an integrated solution to satisfy the rigorous pharmaceutical industry regulations. Panasonic has established a worldwide reputation as a manufacturer of high-quality and innovative medical and laboratory equipment over the past forty years. Long lasting relationships have been built with leading pharmaceutical, healthcare and biotechnology companies as well as with major academic and research institutes in Europe. Panasonic’s biomedical equipment features world-class, high-quality medical and laboratory equipment – backed by more than 40 years’ experience in the sector. The complete line of Panasonic Biomedical products includes an array of laboratory equipment with the most advanced technology, controls, construction and performance attributes in the industry. Today we apply the most sophisticated refrigeration compressor design and state-of-the-art electronics to ultra-low and cryogenic freezers, refrigerators, incubators, and environmental chambers marketed to life science, pharmaceutical, biotechnology, healthcare and industrial laboratory markets.